Original WW2 Wehrmacht Krimschild in very good used condition complete with army field-grey backing-cloth and magnetic back-plate. One of the four prongs on the reverse is missing. 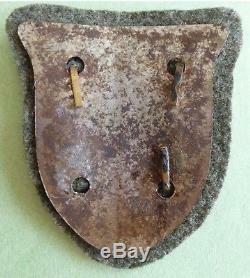 The item "Original WW2 German Crimea Shield (Krimschild) with army cloth & back-plate" is in sale since Tuesday, June 12, 2018. 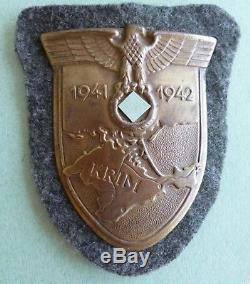 This item is in the category "Collectables\Militaria\World War II (1939-1945)\Badges". The seller is "c010nel" and is located in Houghton le Spring.